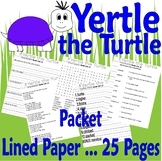 This activity goes along with the Dr. Seuss Yertle the Turtle book. Students use the Engineering process while trying to create the tallest tower they can for Yertle to sit on. Included is the challenge itself and a graphic organizer for the Engineering Process. Six thinking hats is a creative thinking technique that has students put different color hats to represent different thinking. 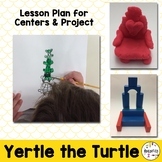 This product includes a bulletin board set of the hats and six thinking hat questions using the Dr. Seuss book, Yertle the Turtle. 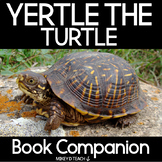 This set includes problems loosely based on Yertle the Turtle. Included is a data sheet with seven turtle heights. Students use these heights to solve for heights of turtle stacks which require adding 2-4 two digit numbers to make various turtle stacks. Great for Read Across America Day! This flipchart works with Active Inspire 8 Slides include: Character Reputation Using evidence to support thinking Reflection Great Resource to be used with a mentor text or after reading. 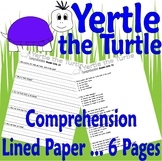 Students watch Yertle the Turtle on YouTube and fill out these discussion questions relating to types of government. 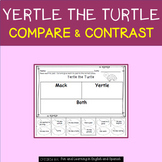 Comparing Yertle to a dictator. At the start of the year with my honors and regular tenth graders I have them read the Dr. Seuss story Yertle the Turtle to help them review literary analysis. This is a great story to introduce them to analogy as well, as the whole story is an analogy for the Holocaust. Use for Dr. Seuss week activities. Students read the book and map the Story elements as they read. Includes a place for them to add evidence for their map entries. Can also be used as a comprehension assessment after reading. Includes character, setting, problem, solution and lesson. Also included in: Kindergarten Art Curriculum. Art Lesson Plans, Projects, Rubrics and Worksheets.